In conjunction with our 40th anniversary celebration, we've invited noted regional historian Kevin Wright to give a talk on the "History of the Meadowlands, pre-1969." Kevin will present a free slide show and lecture on Tuesday, February 17, at 7:30 p.m. 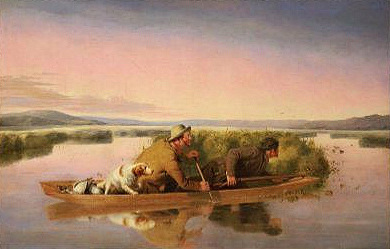 Topics include the Lenni Lenape, the Hackensack River,and how the region developed. He will also answer questions. Place: Meadowlands Environment Center, Two DeKorte Park Plaza, Lyndhurst, NJ 07071. To participate, please RSVP to Donna Bocchino or call 201-460-4637. 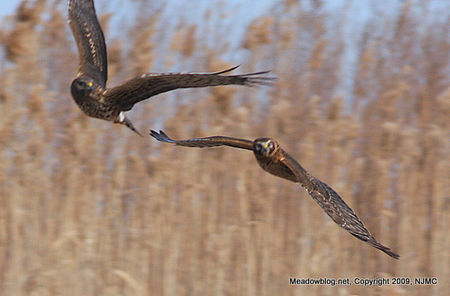 By now, we are certain that the Meadowlands in winter is one primo place to see raptors — from Rough-legs and Harriers to Peregrines and Kestrels. Not to mention the frequent Bald Eagles and (this winter) a Snowy Owl or two. We've received several raptor shots from readers of this blog this week, and we thought we would post them — or links to them here. 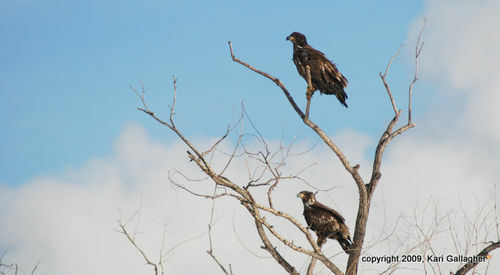 Above and below are immature Bald Eagle shots taken by Mehrhof Pond in Little Ferry. 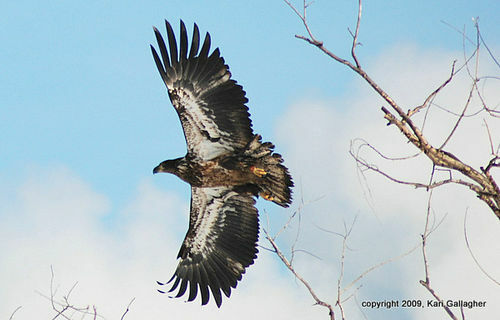 To see a couple of Ray Duffy's Rough-legged Hawk pix, click here and here. To see Ray's Rough-legged video, click here. 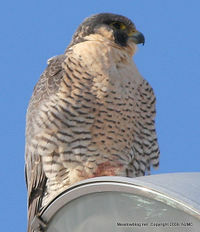 To see two of Deborah Allen's NYC Peregrine photos, click here and here. She wonders if some of the Peregrines may be foraging in New Jersey, as she sees them headed west over the Brooklyn Bridge and out of sight. Both birds have been banded with black and green bands, like the pictured earlier this month on this blog here. If you haven't seen the Meadowlands Commission's William D. McDowell Observatory, what are you waiting for? The free public viewing schedule has been announced for February, Mondays and Wednesdays from 7-10 p.m.
Click "Continue reading…" for details and link. Mehrhof Pond, Little Ferry, 11 a.m. The Star-Ledger had an interesting wire story on Snowy Owls yesterday. The main thrust: "Biologists say an increase in snowy owl sightings across northern states suggests that the arctic species is doing so well on its northern breeding ground that competition is driving the young ones south." Link to the Associated Press story is here. Snowy Owl information from the NY State DEC is here. 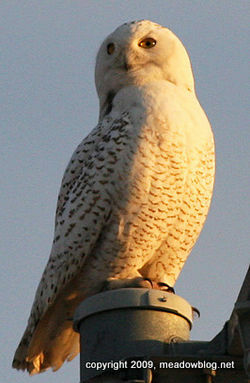 E-mail us here if you would like to know more about the Snowy Owl(s) in the Meadowlands. We have played down their presence because too many people were trespassing on private property — and getting too close tothe birds. Our free 40th Anniversary walk of the month for February is the Great Backyard Bird Count walk, on Friday at 10 a.m. at DeKorte Park in Lyndhurst. 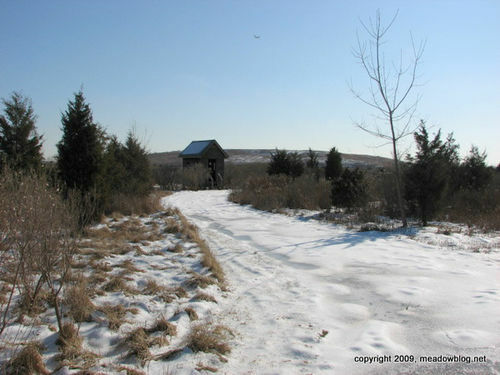 In conjunction with the nationwide Great Backyard Bird Count, NJMC is holding this winter nature walk to see (and count) waterfowl and other birds— followed by hot chocolate and light snacks at the Meadowlands Environment Center. The walk will be led by NJMC Naturalist Mike Newhouse. Contact us here to RSVP. Check this blog for updates and more information. Limit: 30 people. Want to learn more about astronomy? 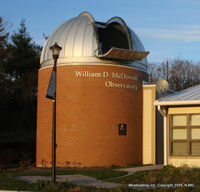 Check out the monthly courses at the William D. McDowell Observatory in DeKorte Park, Lyndhurst. Light, Telescopes, Astronomical Instrumentation: The Basics & What We Have Learned from Their Use. Click "Continue reading…" for details. Tomorrow: The observatory's public viewing schedule for February. To commemorate Black History Month and the Meadowlands Commission's 40th anniversary, we are going to post "Black History Wednesday" posts on this blog during the four weeks of February. Topics include such local notables as Ruby Dee, the famous actress, and Leonard Coleman, former chairman of the Meadowlands Commission and former president of Major League Baseball's National League. We'll also look at Jersey City's role in the Underground Railroad, and honor a Tuskegee Airman. We don't want to make anyone feel bad if they missed Monday morning's Raptor Ramble and Duck Walk near DeKorte Park in Lyndhurst, but the 11 souls who braved the freezing weather did get great looks at a Peregrine Falcon that was perched on a nearby light stand. Soon after, the Peregrine flew into the field and harassed a Snowy Owl. Some show. We also had good looks at an American Kestrel, Northern Harriers, Rough-legged Hawks and Redtails. 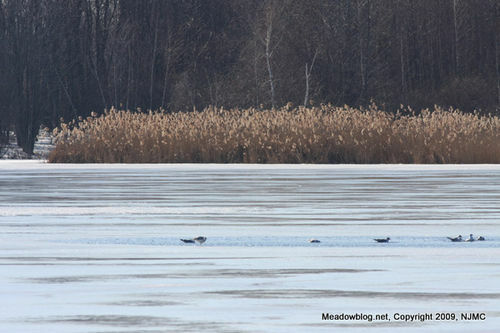 Later, because the impoundments at DeKorte were frozen over, walk leader Mike Newhouse took the group to Gunnell Oval in Kearny to see a Northern Shoveler and a lot of American Coots. We'll post info on our February walk soon. Can you identify this threatened species found in the Meadowlands? For answer, click on "Continue reading…" immediately below. For more Tuesday Teasers, click here.